Gentlemen of discerning taste know the Michael Bastian brand is synonymous with bespokesports and casualwear. 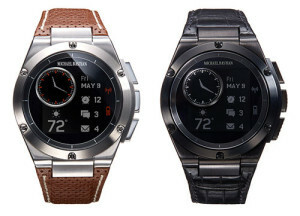 And now, the award-winning menswear designer has partnered with Hewlett-Packard’s world-class engineers to create a luxury wearable that combines the refined style of a classic wristwatch with cutting edge technology. The Michael Bastian Chronowing Smartwatch was born in New York, but made for international businessmen, jetsetters, and style aficionados. No matter where the road takes you, Big Apple Buddy’s expedited international shipping will ensure sure your most stylish accessory is waiting for you. The gentleman’s smartwatch indeed. As Michael Bastian notes in The Wall Street Journal, his new wearable technology is “intended to make you more polite.” The Chronowing favors the characteristics of a traditional, high-end watch rather than the bulky, high-tech gadgetry you see in other smartwatches. The intention of the Michael Bastian smartwatch is to keep you more present in your current setting while tracking the pulse of your other affairs with a quick glance. The Chronowing is the only wearable technology that compares to the timeless craftsmanship of your favorite watch. The 44mm stainless steel case and multi-layered crystal face exhibit the attention to detail you expect from designer Michael Bastian. No detail is overlooked. The side dials even mimic the popular molding of a chronograph watch, with three side buttons that allow you to switch between 10 usage modes for total responsiveness and control. 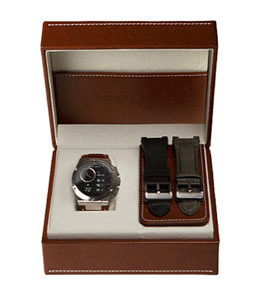 Michael Bastian knows fashion and style are as important as functionality, so the Chronowing offers three interchangeable bands to suit the moment. Choose the supple, perforated brown leather strap when you’re feeling dapper, switch to a silky black rubber band for active afternoons on the water (while enjoying 50m of water resistance), or kick back with an olive-green ballistic nylon strap for casual nights on the town. 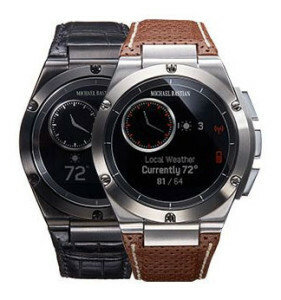 Buy your HP Michael Bastian Chronowing Smartwatch and get a free shipping quote from Big Apple Buddy when shipping to South Africa, New Zealand, Singapore, Australia, Hong Kong, Croatia, Slovenia, Slovakia, Germany, Norway, France, Italy, Spain, UAE, the UK and more. Now luxury is never out of style or out of reach for men of superior taste.